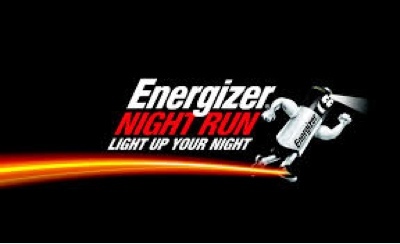 Did you have a read of the Energizer Night Run #MyMoments post?! 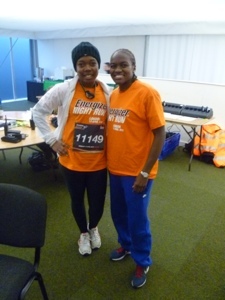 Did you know then that my next post would be my interview with Olympic Gold Medallist and Energizer Night Run Ambassador Nicola Adams?! …wait no more! I had ten minutes…scarier than the race itself but I was assured that Nicola was lovely. I racked my brains about what to ask her…I didn’t want to come with the same questions she has surely been asked a million times before. Then I was confused…she’s a boxer…we’re at a running event…which direction should I go?! …This is it! “Hi Nicola. My name is Elle, of Keep it SimpElle; it’s a pleasure to meet you! ….Before I begin, I would like to congratulate you on your Olympic success of 2012. Yes! 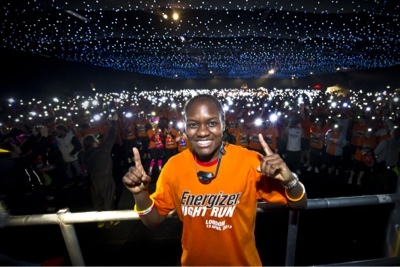 I’m aiming to inspire the next generation to take up sport; do this run and keep fit! It’s not all about winning, it’s about getting involved and all the positive energy that comes from that! I’ve always had a passion for sport and boxing in particular. It all started when mum took us to the club with her as she had no babysitter. I absolutely loved it. Opportunities like tonight’s run are great to get people back into sport. Go for it! Don’t let anything stop you! Just find the energy to keep going! I have to dig deep for that extra energy and stay focused. If I’m having a lazy day, I remind myself that my opponent could be out there training…. I definitely wear whatever is comfortable! Usually a t-shirt and shorts or skins and shorts! I use electrolyte drinks to stay hydrated; mostly a drink called SiS. LIGHTS ON or LIGHTS OFF? !…LIGHTS ON!! …girl after my own heart!